for our upcoming production of Steel Magnolias. or via phone if you prefer (07 81 02 78 14). 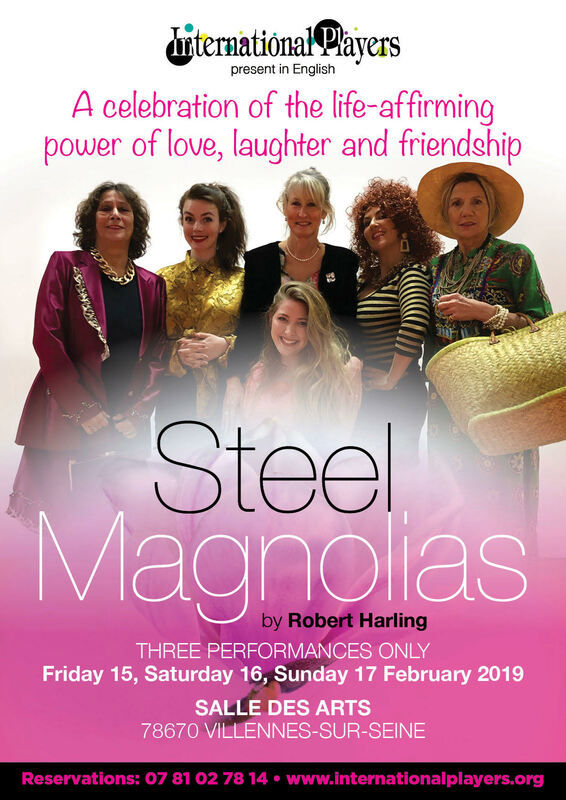 Steel Magnolias is a play that epitomises the bond of female friendship. And what better setting than Truvy's hair salon in small-town Louisiana to represent a bastion of feminine solidarity? The six characters are women of different ages, each with a distinct personality. These are the steel magnolias of the title, possessing "the strength of steel, but the gentleness of a magnolia." illness, death - loving and helping each other with humour, dignity and compassion. The one-liners come thick and fast, but there are tears as well as laughter for a serious theme underlines the comedy. Steel Magnolias is not just about six women in a small southern town, it's about all women. It's no surprise therefore that it ran for almost three years off-Broadway and became an award-winning film. Follow us on Facebook and Instagram @internationalplayersfrance for behind-the-scenes details and more! Tell your friends by RSVPing to and sharing our Facebook event on your own Facebook page, and by forwarding this email (flyer below).